The Mimi Jones Band Birthday Bash! 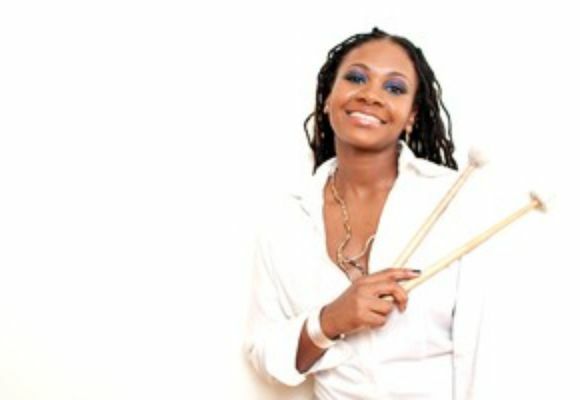 The Carl Bartlett Jr. Quartet Music From Debut Album, "Hopeful"
Drummer, educator, clinician, author and health coach, Shirazette Tinnin was born and raised in North Carolina. As a child she would travel with her parents listening to them sing in large Southern Gospel groups up and down the east coast. Due to her musical family and surrounding peers, her initial gospel influences eventually grew and branched out into jazz, soul, and many other styles of music. From the time that she was 4 years old, she knew that she would play the drums. As she grew older, Shirazette would come to share the stage with national and local acts such as Melva Houston, Joe Robinson, The Solos Unit, Lyfe Jennings, and Rehab before attending college. A graduate of Appalachian State University, Shirazette studied with Todd Right, Dr. Rob Falvo, Rick Dilling, and Scott Meister. In addition to her academic background, she has also received private instruction and mentoring from great musicians such as Cindy Blackman, Lewis Nash, Terri Lynne Carrington, Allison Miller, Sherrie Maricle and Ernie Adams. Shirazette maintained an active life, receiving her degree in Music Industry Studies while simultaneously performing in and out of school with various groups. She also recorded her first album with Sinclair, “Stories of This Land,” during her studies as a percussionist at Appalachian State University. She went on to graduate as one of the top percussionists in her department, earning both multiple jazz scholarships and an athletic scholarship for basketball during her time there. Following her years at Appalachian State University, Shirazette was offered the opportunity to attend Northern Illinois University on a full scholarship for drum set and jazz pedagogy. She accepted, and in 2005 relocated to Dekalb, IL to study with Ron Carter (saxophonist and jazz educator) as well as get involved in the Chicago music scene. She began by performing in various projects around the Chicago area with flutist Nicole Mitchell as well as representing NIU in the Liberace Jazztet Scholarship Program. Shirazette also became one of the last recipients of The Sisters in Jazz Collegiate All-Stars for IAJE (International Association of Jazz Educators) Award in 2008, and also taught as a professor at Columbia College in Chicago. As her time in Illinois went on, her stage performances grew to include greats such as Jimmy Heath, Slide Hampton, Renee Baker, and many others. Shirazette also began her international travels to Spain and Peru while at Northern Illinois University, accompanying various artists. While in Peru she discovered her love for Cajon and was inspired her to write a song that eventually was included on The Liberace Jazztet album release, “Equity.” Shirazette's love for Cajon and world music followed her as she moved from Illinois to New York City in 2009, ultimately becoming the resident drummer at Tutuma Social Club with the internationally acclaimed Gabriel Alegria Afro-Peruvian Sextet. Today, Shirazette is now an in demand drummer in New York City. She has recently been on tour with Tia Fuller at The Umbria Jazz Festival, Molde Jazz Festival and the Turkish Ambassadors in D.C., as well as leading her own group, The Shirazette Experiment Core-Tet, which has performed both in New York City and overseas. In addition, Shirazette is performing and collaborating with various artists such as Orrin Evans, Tom Browne, Mimi Jones, Pauline Jean, Donald Malloy, Camille Thurman and many others. She strives to keep the motion of jazz music progressive in all of her endeavors. Besides performing as a professional musician, Shirazette is an active clinician and teacher, constantly sharing her knowledge to anyone open and willing to learn. She is also author of two published articles for Modern Drummer and Tom Tom Magazine. Shirazette has the skills and mindset to take her to new levels and new pages in her musical career greater than what she has already accomplished. She is currently in the studio working on the release of her debut album as a bandleader, and is signed with the new record label Hot Tone Music. It is to be released in 2012.